Basil is one of the most popular herbs to cook with so I want to give you some ideas on how to use basil other then in your pasta dishes or pesto. Basil is a versatile and widely used aromatic herb. Basil is an annual plant that is easy to grow from seed but is very sensitive to cold. The plant grows well in warm climates and is widely used throughout southern Europe, particularly the Mediterranean, and in many parts of Asia. There are numerous species of basil; some have scents reminiscent of pineapple, lemon, cinnamon or cloves; others have beautiful purple leaves. 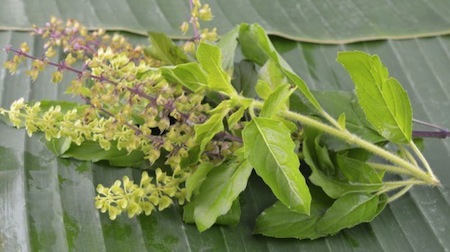 The variety called holy basil “Tulsi” (see photo) is an essential part of an authentic Thai curry. In Mediterranean regions, basil and tomato is a classic combination. Pesto, made from basil leaves and pine nuts, with parmesan or pecorino cheese and olive oil (traditionally pounded together in a mortar and pestle – the latter lends pesto its name) is another classic dish. Basil is an herbal antibiotic, antiseptic and appetizer that has an special affinity for the stomach. Basil significantly benefits the stomach during digestion and can provide immediate relief from gas, stomach cramps and nausea. It also contains powerful anti-inflammatory properties and can provide relief for inflamed bowel conditions such as colitis, IBS, crohn’s and celiac disease. It is also highly antibacterial and antiviral making it effective against bacterial infections, intestinal parasites, colds, flu and herpes. 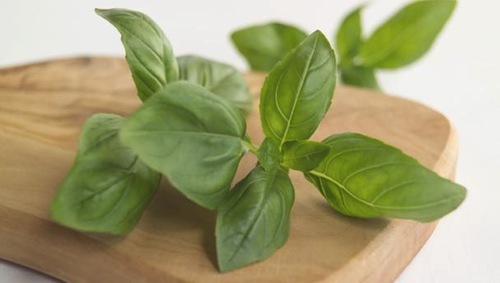 Basil is a rich source of magnesium which relaxes muscles and blood vessels and supports cardiovascular health by lowering the risk of irregular heart rhythms and spasms. 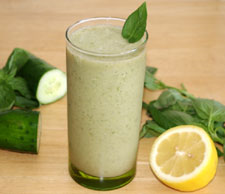 In this blog I want to share four recipes with you: a salad, a smoothie, dessert and a cocktail. 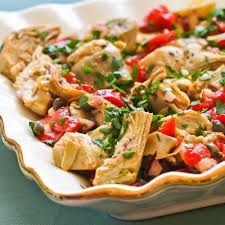 Mix the peppers and artichokes together in a bowl and season with salt and pepper. Add a little oil from the jar, if needed, or olive oil along with the basil leaves and balsamic vinegar. Put capers on top of the salad and the dressing. Start by adding the liquid to your blender followed by the soft fruit. In a large bowl, combine almond flour, coconut flakes, slivered almonds, coconutsugar, allspice, cinnamon, 1 teaspoon of the orange zest and sea salt. Add coconut oil and mix well to combine. Place in the refrigerator for 1 hour. Bake for 45 minutes. 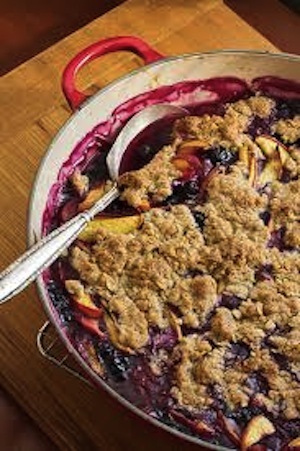 Remove from the oven and set aside to cool for 5 minutes before serving. Sprinkle with fresh basil, mint and the remaining teaspoon of orange zest. Serve warm. Place the basil between two sheets of kitchen paper and roll hard with a rolling pin. 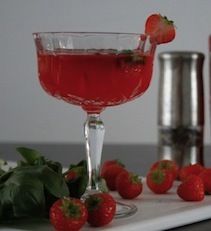 Add a handful of ice, the strawberries, cognac, strawberry liqueur, lemon juice, basil and sugar syrup to a glass and top up with water. Stir the cocktail and enjoy!